As a business owner, are your Facebook fans seeing your posts? As someone who “liked” a business page, are their posts appearing in your news feeds? Maybe. Maybe not. Recently, a very shocking piece of info began appearing at the bottom of status updates posted by business page admins – the number of people each post reached coupled with the percentage of their total “likes” it represented. So, basically that tells us that ALL the people who like a page aren’t seeing your posts, because Facebook didn’t publish in ALL their news feeds. What the heck! That’s not right! Translation – most of your fans don’t receive your posts. Ever. Facebook only shares them with fans who have frequent interaction with your page – return often, post or comment on your page, etc. In other words, the minority. Sure, Facebook offers business pages the opportunity to “promote” their pages but um, haven’t they already done that if they have a zillion “likes”. Why should they have to pay, I mean “promote” to post??? This “promote” option Facebook offers isn’t to advertise – that’s an entirely different ballgame. This is simply to reach the fans you already have – the ones who thought clicking “like” added you to their news feeds. For some businesses that could mean $500. Per post. No thanks. So how do we go back door on this and work a solution for business pages and fans of business pages alike? In theory, this should put more posts from the page back in your news feed. Hard to know, since the only way to test it is to keep visiting every page you’ve “liked” to compare their posts to your news feed. And who has time for that? Certainly not us, not you, not anybody we know. 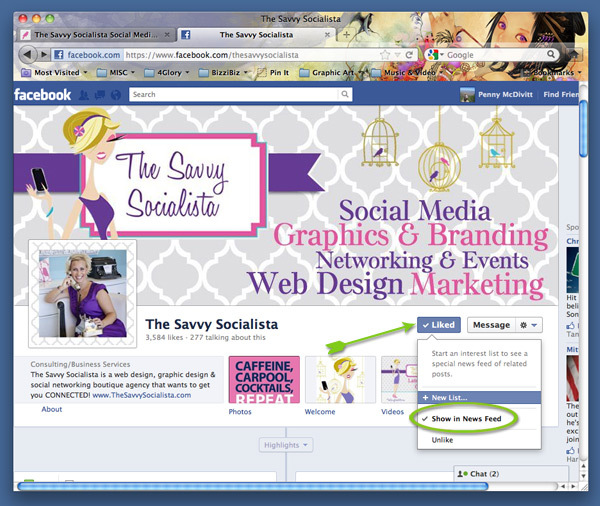 Make sure you not only “like” The Savvy Socialista on Facebook, but check the Show in News Feed option as well. And do that for ALL the pages your like – or else you’re missing out! Isn’t it just a shame! Jami, you worked so hard for our 2,700 fans!!! Please let us know if you hear of a solution. This is just great. Some of us are owners of small businesses that rely on social media to get us out there with low or no cost. Now that Facebook has taken away our option to message our fans, and our posts aren’t showing in the newsfeed of ALL of our fans, how do we get this message out there to them? Plus, there should really be a way for us, the page owners, to take care of it for them. It’s our business and, I believe, not our customers responsibility to handle Facebook screwups.